The atmosphere was electric. Talks ran the gamut, from wildly creative thinkers who apply mathematics in the world of design to examples of pure mathematical results discovered through computer experimentation and visualization. It shed light on how powerful visualization has become for studying and sharing mathematics. 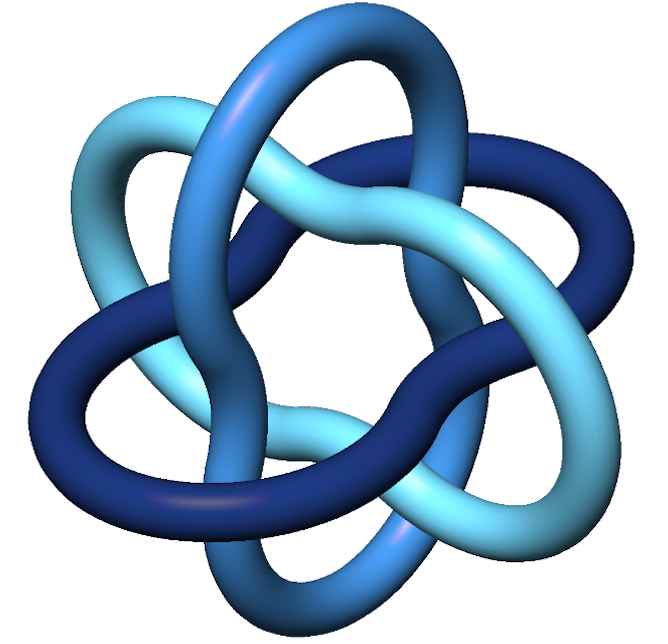 The “bubble” version of the configuration, shown below, is minimal, in the sense that it is the shortest possible shape where the tubes around the rings do not overlap. It’s as if you were to blow a soap bubble around each of the rings in the configuration. Techniques for proving that configurations like this are optimal often involve concepts of flow: If a given configuration is not the best, there are often ways to tell it to move in a direction that will make it better. This topic has great potential for visualization. At the workshop, Sullivan dazzled us with a video of the three bands flowing into their optimal position. This animation allowed the researchers to see their ideas in action. It would never be considered as a substitute for a proof, but if an animation showed the wrong thing happening, people would realize that they must have made an error in their mathematics. Their first 3-D printed dress consists of thousands of interlocking pieces designed to fit a particular model. In order to print the dress, the designers folded up their virtual version, using protein-folding algorithms. A selective laser sintering process fused together parts of a block of powder to make the dress, then let all the unwanted powder fall away to reveal its shape. Meanwhile, a delightful collection called Geometry Games can help everyone, from elementary school students to professional mathematicians, explore the concept of space. The project was founded by mathematician Jeff Weeks, one of the rock stars of the mathematical world. The iOS version of his “Torus Games” teaches children about multiply-connected spaces through interactive animation. According to Weeks, the app is verging on one million downloads. 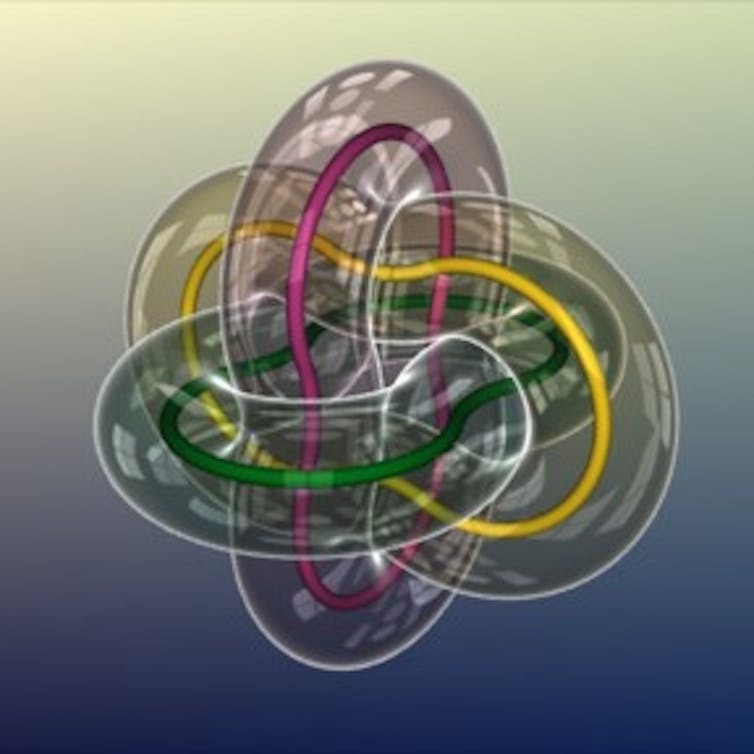 I developed this algorithm in the 1990s to visualize mathematical ideas that have one dimension too many to see in 3-D space. The algorithm offers a way to use color to visualize something seemingly impossible to visualize in one diagram: a complex-valued function in the plane. This is a formula that takes one complex number (an expression of the form a+_b_i, which has two coordinates) and returns another. Seeing both the 2-D input and the 2-D output is one dimension more than ordinary eyes can see, hence the need for my algorithm. 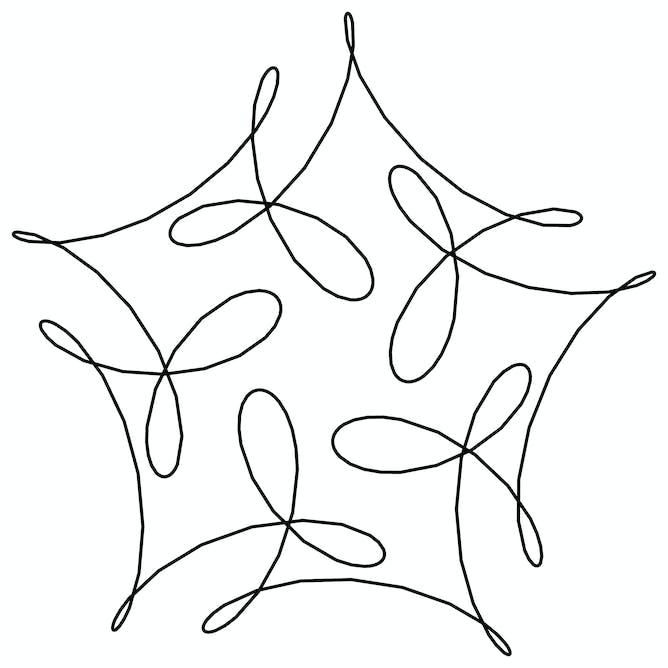 Now, I use it to create patterns and mathematical art. My book starts with a lesson in making symmetric curves. 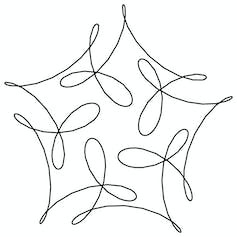 Taking the same idea into a new dimension, I figured out how to weave polyhedral solids – think cube, dodecahedron, and so on – from symmetric bands made from these waves. 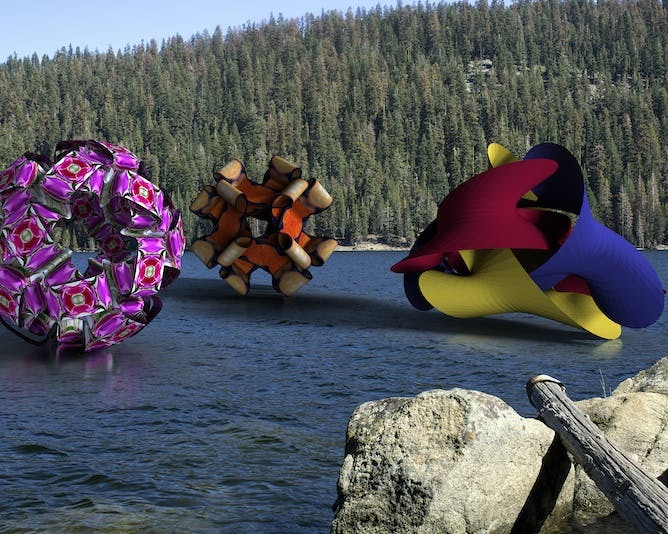 I staged three of these new shapes, using Photoshop’s 3-D ray-tracing capacity, in the “Platonic Regatta” shown below. The three windsails display the symmetries of Platonic solids: the icosahedron/dodecahedron, cube/octahedron and tetrahedron. The author of this article is Frank A. Farris, Associate Professor of Mathematics, Santa Clara University. This article was originally published in The Conversation under a Creative Commons Attribution No Derivatives license. Read the original article here. If you found this article interesting, you may also like a new book out called The Joy of Finite Mathematics: The Language and Art of Math. This book teaches step-by-step procedures, and clearly defined formulae, to help readers learn to apply math to subjects ranging from reason (logic) to finance (personal budget), making this interactive and engaging book appropriate for non-science, undergraduate students in the liberal arts, social sciences, finance, economics, and other humanities areas. We are pleased to offer you a look at the book by providing you with a chapter from the book called “Basic Finance” that covers basic financing including sinking funds and amortization, various savings situations, and comparison shopping (credit versus cash, leasing versus purchasing, and renting versus owning). There is also a section on personal finance (how to create a monthly budget), insurance (what every homeowner should know), and your credit report.